Back to the electrical storytelling… Many times our electricians go on service calls and get the question, “I just moved here and I have no idea what this switch controls, can you look into it?” Usually the answer lies in a quick glance at the ceiling – if there are no light fixtures on the ceiling, chances are good that the mysterious switch controls half of an electrical outlet. Many houses built before the 1990’s don’t have light fixtures in the living room, some don’t even have light fixtures in the bedrooms. 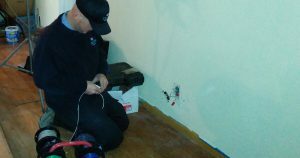 Having switched outlets in a home can become an inconvenience if you are not familiar with exactly which outlets are switched and which outlets are not switched. cell phone and tablets. Sometimes it worked, sometimes it didn’t. We quickly discovered that the outlet was being controlled by a set of switches on opposite sides of the room. The solution: Our electrician replaced the living room outlets and made the top and bottom plug hot all the time. We then used the wall switch locations to control new recessed can lighting…with a dimmer switch of course. Having all the plugs in his living room hot all the time made things more convenient and a lot less confusing. When your lights and outlets are not working correctly, don’t yell “Superman where are you now?” Call on Edison Electric instead – 612-385-7864. We’ll take the confusion out of your electrical system.